Bratislava (AFP) – Russia is more dangerous than the Islamic State group, Poland’s Foreign Minister Witold Waszczykowski told reporters Friday during a visit to Slovakia. “By all evidence, Russia’s activity is a sort of existential threat because this activity can destroy countries,” said Waszczykowski, who was speaking in a debate on the future of NATO at the annual Globsec security forum in Bratislava. “We also have non-existential threats like terrorism, like the great waves of migrants,” he added, according to Poland’s PAP news agency. He described the Islamic State group as a very serious threat but added that “it is not an existential threat for Europe”. 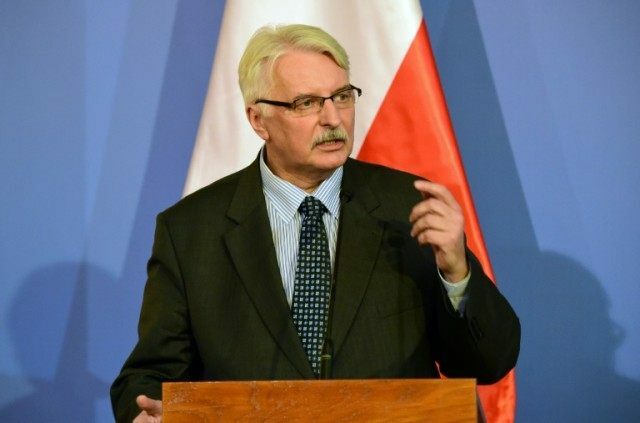 Waszczykowski also called for NATO to approve the deployment of troops on the alliance’s eastern border at its upcoming July summit due to be held in Warsaw. “This will be a symbol of the determination to defend the eastern flank. We can discuss the scale of this deployment,” he said. Czech Defence Minister Martin Stropnicky said at the conference that strengthening the alliance’s collective defence capability would be the main point on the agenda at the summer summit, while warning that Russia “should not be isolated”. He added that Russia was actively “testing the defensive capabilities of NATO in the Baltic region” where a number of countries have come under pressure, the Czech CTK news agency reported. Russia will use rare talks with NATO next week to protest the alliance’s “absolutely unjustified” military buildup in the Baltic states, Moscow’s ambassador to Brussels said Friday, adding the alliance was using the Ukraine crisis as a pretext. The Russian and NATO ambassadors will meet in Brussels on April 20 for their first formal talks in nearly two years to discuss security issues, including the crisis in Ukraine where Moscow is accused of backing pro-Russian rebels against the pro-Western government in Kiev.